Rex Tilbrook ‘s stand at the 1947 Royal Adelaide Exhibition. Over one hundred years ago, on the 2nd of May 1915, Rex Patterson Tilbrook was born in Prospect South Australia. He would grow up to become an innovative engineer, designer and fabricator, who produced high-quality motorcycle accessories, motorcycle sidecars and eventually his own pioneering range of motorcycles and racing machines. But surprisingly it was the motorcar that played a significant role in his early life. After leaving school at the age of 16, Rex found work at a local garage where he made a close study of his customer’s vehicles. Being mechanically gifted, he decided to build a car of his own from an old G.N. cyclecar chassis fitted with an 8h.p. air-cooled V-twin engine that he bought for $6. When the car was completed Tilbrook decided it was time to further his mechanical education. The then 19-year old put the G.N. up for sale to help fund a ticket to sail to England. In 1935 Rex arrived at the world famous Brooklands motor racing circuit in Surrey and quickly established himself as a skilled engine tuner and fabricator. It didn’t take long for his services to be so much in demand that he was able to open his own workshop where his specialist exhaust systems were highly sort after. 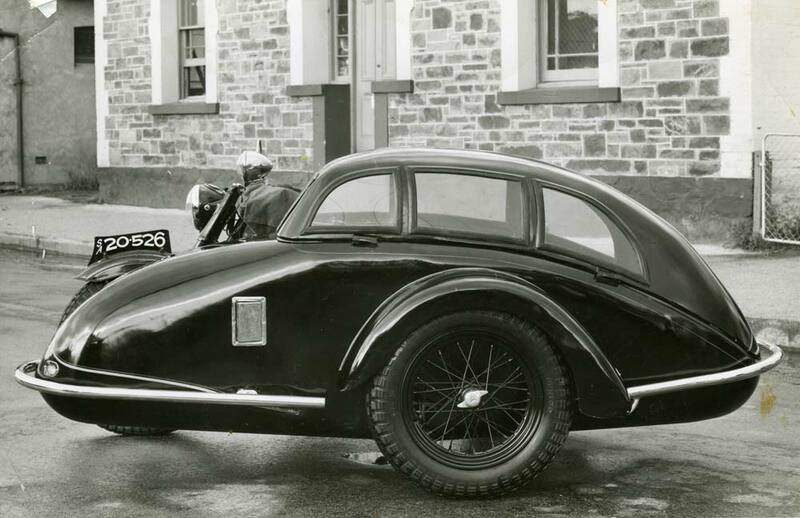 In November 1938 after four successful years at Brooklands, Tilbrook returned home to Australia. The papers described him at the time as an “experimental engineer and driver”, and he had brought something rather special back with him from the UK. It was Maserati 6CM 1.5 supercharged monoposto which he intended to use at the Australian Grand Prix to be held at Lobethal in South Australia on January the 2nd 1939. Unfortunately, he was unable to have the car released from customs in time, although Tilbrook did plan to return to race the car in the European Grands Prix. In the meantime, the storm clouds of World War 2 gathered. One of the Tilbrook sidecar designs outside the Kensington factory. When war broke out later that year Tilbrook became involved in the munitions industry, but his creative mind did not rest, and he built an electric scooter in 1941 which could travel at over 40kph and recharge the batteries when free-wheeling down hills. Rex also came up with the first of his innovative motorcycle accessories, a universal pillion footpeg. By 1947 Tilbrook had moved into a new workshop at Bridge Street in Kensington where he produced a greater range of accessories and spare parts often sought after to restore war-damaged army surplus motorcycles and the first of his beautifully made sidecars. 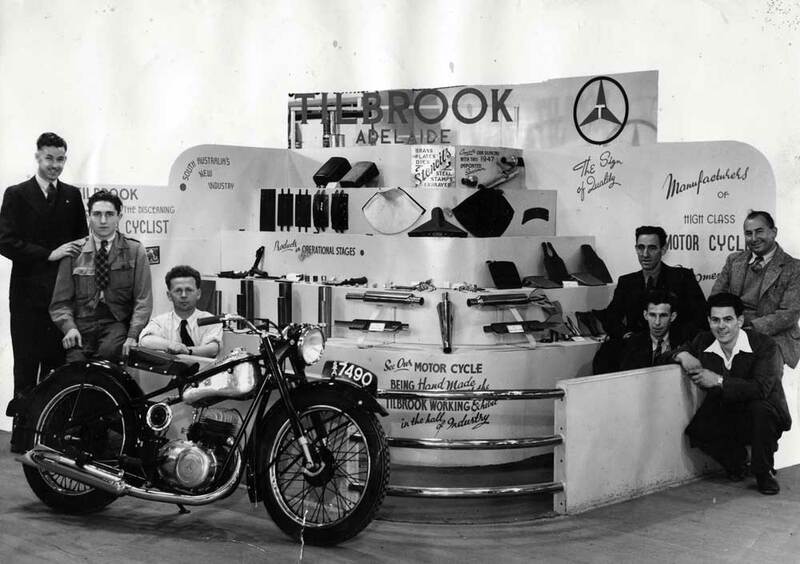 It was also in 1947 that Tilbrook took up a stand at the Royal Adelaide Exhibition, held by the South Australian Chamber of Manufacturers to encourage a post-war business recovery. Rex had come up with the novel idea of building a complete running 250cc motorcycle, of his own design, on the stand inside the 54 days the exhibition was open. Starting with the engine, which was based on a pre-war two-stroke Zundapp design, Tilbrook had the engine castings made locally and machined them on his stand. The engine was completed in 28 days. Only a handful of items, such as primary chains, tyres and spark plugs, were not manufactured on the spot. The bike featured a 20amp generator that enabled starting with a flat battery, while other innovations included hydraulically damped telescopic front forks with air caps. The 250cc machine though was never put into production, with Rex turning later to the more readily available British Villiers 125cc and 197cc two-stroke engine units. Tilbrook would also first try out his many futuristic ideas in competition by building several 125cc racing machines in 1949. The 125cc racing bikes were loosely based on the Villiers engine with the bore and stroke being changed to 52x58mm. Methanol fuel was used and delivered through a two-stage system utilising Amal TT carburettors. A smaller 1inch carby was fully opened at half throttle with a 1 3/16inch unit taking over until full throttle was reached. The cylinder head was designed and cast by Tilbrook and a heavily revised barrel sporting two inlet, two exhaust and four transfer ports brought about combustion with the help of a BTH magneto running at half engine speed to provide the spark. The original three-speed gearbox was replaced with a four-speed unit also developed by Rex. Useful power was made between 5,500 and 8,400rpm, which was sufficient for a top speed of around 90mph (145kph). 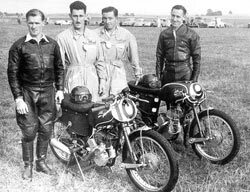 Alan Wallis, the Tilbrook mechanics and Rex Tilbrook with the 125cc racers. The well-presented Tilbrook race team consisted of Rex and Alan Wallis as riders with two mechanics suitably dressed in blue overalls that gave an air of professionalism. Over the ten years, the racers were developed, they accrued numerous race victories in South Australia, Tasmania, Victoria and NSW, with many of the ideas and innovations developed being carried over to the road going models. When the Tilbrook roadsters finally started to trickle into production in 1952, what set them apart from other Australian produced machines was (with the exception of the engine/gearbox and Lucas lighting set) that everything else was made in South Australia. Also, the Tilbrook had a unique appearance utilising a combination of features that were best suited to Australian conditions. This in many ways made the Tilbrook radically different. A key feature was an 18lt fuel tank for extended distance Australian touring, a large flared front mudguard and a combined rear mudguard and seat assembly to protect a rider from mud and dust of the many unsealed roads. 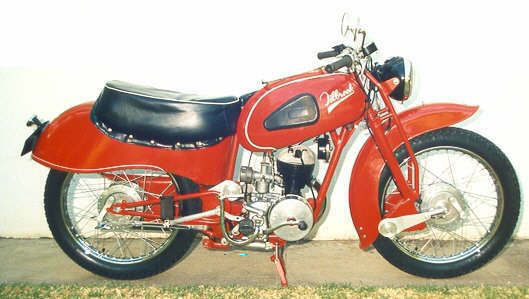 At a time when few motorcycles had rear suspension, and lightweight machines had primitive, limited travel telescopic front forks, Rex used a rear cantilever swingarm with twin underhung springs below the gearbox and a radial front suspension that provided superior handling to a comparable imported model. But the innovation didn’t stop there; the front and rear wheels were interchangeable and sported full width finned aluminium hubs with 37mm wide brake shoes working against shrunk in cast iron linings. This provided a superior coefficient of friction when braking and the finned hubs made brake cooling more efficient without a hint of brake fade that plagued the more commonly used steel drums of other manufacturers. All models had steering dampers as standard, which generally was an option on larger machines of the day. A useful chrome tank rack was also provided, and the Tilbrook used a round 80mph (128.7kph) speedometer with odometer and trip meter mounted above the headlight compared to the more common D shaped gauge of other lightweights. The beautifully made Tilbrook roadster. A comprehensive tool roll was provided in a large compartment under the press-stud fixed seat and was extensive enough to totally disassemble the whole motorcycle. There was also a puncture repair kit with plenty of room for any other spares an owner might feel necessary. A tyre pump was also provided and this fit under the seat mudguard assembly. At a time when black was a predominant colour, the Tilbrook was a striking red with lashings of cadmium and chrome plating presenting a high-quality standard of finish. It’s believed that around sixty of the 125cc and 197cc roadsters were produced before motorcycle production stopped in the late 1950’s. The market was shrinking with cars becoming cheaper, and motorcycle production became the least profitable part of the business. The accessory, spare parts and sidecars continued although in later years Tilbrook survived by concentrating on contract work, making special manufacturing machines and general engineering. The factory finally closed its doors in 1976. Rex Patterson Tilbrook passed away in 1997 leaving behind a quite remarkable motorcycling legacy. This entry was posted in Motorcycle Racing, Motorcycling and tagged Brooklands, G.N. Cyclecar, Maserati 6CM, Rex Tilbrook, Tilbrook, Two-stroke engine, Villiers on 30/07/2015 by Geoff Dawes.